I love the promise of a new year. As soon as Christmas ends, my mind starts anticipating the freshness that comes with starting on day one of the new 365. When the calendar rolls over, I’m ready to make the leap into new adventures and, Lord willing, improvements to my life. This year, more than in years past, I’m looking forward to a blank slate and new perspective. It is not unusual for someone to make resolutions in anticipation of starting over, but I'm taking the idea of change and motivation a step further and bringing my family along with me. We’re adopting a family motto. This past year was full of change for the Naaktgeborens. We finished building our house and finally moved in at the end of summer. For the first time, both my kids were in school which meant more streamlined mornings. I had the opportunity to write more, but was also bogged down by work woes. It truly was a year of highs and lows and, as a result, I found myself turning more inward. This year and beyond, my family will focus on loving God and loving people. As we pursue God, our hope is He will use us to see the good and be the good in our own family, in our friendships, in our church family, and in our community. Sometimes it’s difficult to see the good, especially when a situation seems like anything but. It’s easy to get bogged down by trying situations, but much easier to endure when your heart is close to God. Saturating your life with scripture and prayer gives you the ability to see the good in tough people and tough situations. I have said these things to you that in me you may have peace. In the world you will have tribulation. But take heart; I have overcome the world. Jesus has already overcome the world; why do we walk around in our day-to-day lives like He hasn’t? As Christians we know we have eternity waiting for us, an eternity worshipping our perfect, loving, sovereign God. God has overcome the world. That gives us the freedom to see the good, the silver lining, in every situation because God works everything for good. It also allows us to see the good in the people we encounter every day. We are quick to judge a person by a particular situation, but one thing I’ve learned in my thirty-seven years is that there is more going on than meets the eye. Every person is carrying his or her own burdens. We shouldn’t be so quick to throw stones while we have planks protruding from our own eyes. Part of loving others as God loves us is to maintain friendships and relationships despite all the imperfections. Loving others also gives us the opportunity to be the hands and feet of Jesus. We can live lives where our fruit can impact others. Lives where we are doers of the word and not just hearers (James 1:22). I want my family to bear good fruit and, in doing so, learn to look outside themselves. By creating opportunities for good, as a family we can make a small impact in the lives of others. 1. Doing good in private or secret is desirable. 2. If doing good in secret is unavoidable, then ALWAYS give God the glory and the credit. Remember that putting God first in your family will lead to less selfishness and more selflessness. 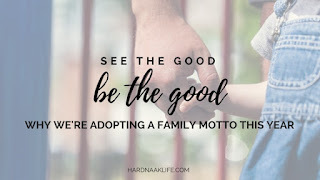 My hope is that adopting this family motto and putting it into action will make seeing the good and being the good second nature in the lives of my family members. And I hope they will pass along this tradition and legacy to their own children. 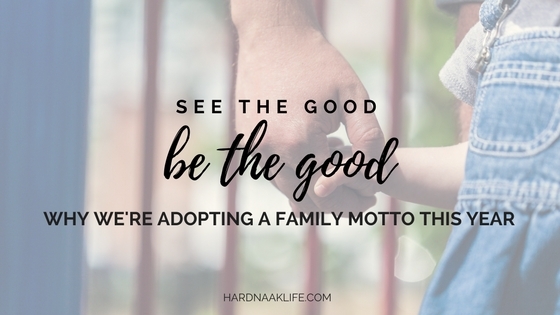 See the good; be the good will be our family motto, but our hope is that you will join us in the pursuit of loving God and loving others. Visit this page to download some simplistic designs to print or use as your desktop wallpaper to serve as a reminder in your everyday life. 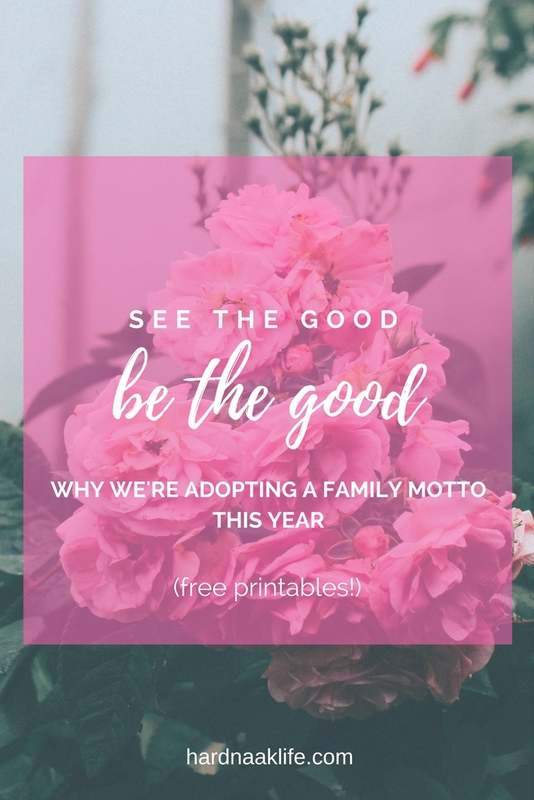 Will you join us in seeing the good and being the good in your own families and communities?